Info "Hit them all with the bat!" Stick It to the Man is one of Dribble and Spitz's Microgames in WarioWare: Smooth Moves. The player has to slap a man's back (in the first stage) and the hands away from stealing the object (in the second and third stages). 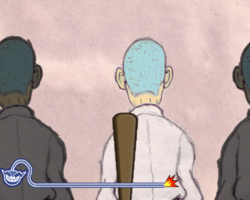 1st level difficulty: Whack the man facing away. 2nd level difficulty: Whack the thief. 3rd level difficulty: Whack the three thieves. This page was last edited on February 20, 2018, at 15:21.